SOGS Orientation (Fall, Winter, and Summer) is planned by the VP Student Services in partnership with the SOGS Orientation & Social Committee (OSC). It partners with numerous stakeholders, including other SOGS committees, to offer a welcoming atmosphere to incoming and current graduate students. In addition to overseeing Orientation, the OSC also runs monthly socials for graduate students. Our 2018-2019 Graduate Orientation Handbook is now available! “The Essentials”: Welcome to London Ontario and Western University! Check out this Self-Guide to London, Ontario! There are various discounts in London (e.g. 10% off on Tuesdays at Loblaws, Valu-mart, Food Basics, Metro, etc). Keep an eye on the flyers, too! Familiarize yourself with your Local Food options. London is typically cold in the Winter so take advantage of our discount with Columbia Sportswear offered three times a year. Don’t forget winter tires and a snow shovel! 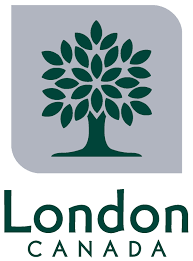 Take note of the London Hospitals, London Libraries, Garbage/Recycle schedule, London Hydro (Water/Electricity/Heat), and Internet providers. Make yourself aware of the Ontario Residential Tenancies Act. Your WesternID provides you access to the Grad Student Portal (SOGS bursaries), Western 365 Email, Student Centre (tuition, scholarships, government funding, class schedule, grades, tax, transcripts, apply to graduate, change in degree status), and OWL (course management). Your WesternONE (Student card) also functions as your bus pass, your library card, and your Campus Recreation (Gym) Pass. You can also use it for Office and AV Keys, Parking pass (if applicable), Campus and/or Rez Meal Plan card (if applicable), and as your identification card for exams. See here for a list of support and equity services available at Western. SOGS produces a Graduate Orientation Handbook. If you are a new student, you will receive a hard copy of it at SGPS Orientation. Full-time students receive a SOGS bus pass (WesternONE card). Full-time students are automatically enrolled in the SOGS Health Plan. SOGS offers a Food Bank for Non-TAs (PSAC 610 offers one for TAs). SOGS offers a FREE International Student Identity Card through CFS. SOGS provides an INTL Grad Student Guide to Western University. 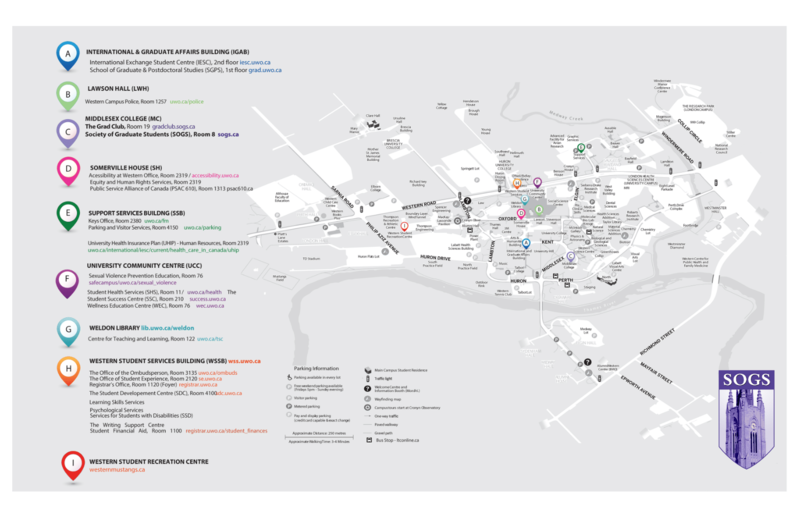 Need help navigating your way around Western Campus? This map has been tailor-made just for you! Our 2018 Orientation sponsors include: Studentcare (SOGS Health & Dental Plan provider), the International & Exchange Student Centre (IESC), PSAC 610 (GTA Union), the Office of Student Experience (including Indigenous Services), the School of Graduate and Postdoctoral Studies (SGPS), Health Services, the Centre for Teaching and Learning (CTL), Western Libraries, the Ombudsperson, Equity and Human Rights, Campus Police, and Parking Services. Family BBQ (5:00-7:00pm @ the Grad Club). $5 for adults and free for children under 12. Includes: hamburger/hot dog (veggie option), fries, veggies, games, and prizes! This event is sponsored by: the London Knights, East Park, and Fleetway. Tickets on sale in the SOGS Office! International Grad Meet & Greet (3:00-5:00pm @ the Grad Club). FREE. Register HERE. Appetizers provided. Prizes to be won! Welcome to YOUR Grad Club (3:00-6:00pm @ the Grad Club). FREE. Grad Student Associations/Councils (President, Chair, Rep) sign up HERE. Refreshments provided; games and prizes to be won! This event is sponsored by the Grad Club and Creemore (FREE beer samples!). Board Game Night (7:00pm @ the Grad Club). FREE. Appetizers (8pm, 9pm, 10pm), drink special, and games galore! Bonfire Night (8:00pm @ the Grad Club). $5. Ticket includes moving screening (Shrek), popcorn, s’more making, hot dog, and corn on the cob. Prizes to be won! Tickets on sale in the SOGS Office! SOGS 50th Anniversary Party (8:30pm @ the Grad Club). $5. Ticket includes pub food, drink ticket, and prizes! DJ styles of “DJ Jade”. Let’s bring the house down! Tickets on sale in the SOGs Office! SOGS and SGPS (School of Graduate and Postdoctoral Studies) have worked together to amalgamate all the relevant resources for graduate students in a single place: the Thriving in Graduate School hub. Through your student fees and OHIP card (UHIP for international students, provincial equivalent for out-of-province students), you have access to Health Services (e.g. medical care, individual counselling, allergy injections and immunizations, birth control, STI testing, and drop-in crisis support in partnership with CMHA-Middlesex Crisis). Psychological Services offers individual and crisis counselling, including sexual violence, eating disorder, and LGBTQIA+ (gender and sexuality) support. You also have access to the Wellness Education Centre (WEC), Graduate Peer Support (GPS), and Graduate Wellness Week. See here to visualize all integral services to support your overall wellness in graduate school. In partnership with Western’s numerous Student Services, SGPS has launched its Graduate Professional Development Program: Own Your Future. Complementary to the program are the services that you can use to strengthen your academic and personal skills and enhance your overall graduate student experience. SOGS aims to keep track of Department Graduate Student Associations/Councils. If your Department Association/Council information is missing from this document, please contact sogs.communications@uwo.ca.